So believes Yale University astronomer Pieter Van Dokkum, who also says that red dwarf stars have been discovered that are over 10 billion years old, which means they've had enough time for complex life to develop and evolve. Van Dokkum notes that research conducted at Hawaii's Keck Observatory concluded that the number of stars in the universe is triple what was previously thought. Until recently, red dwarf stars were not detectable in galaxies outside our own nearby cluster because they are relatively small and dim. Thus, researchers were not able to comprise a total number of red dwarfs present in the universe. "No one knew how many of these stars there were," said van Dokkum, who led the research in this study. "Different theoretical models predicted a wide range of possibilities, so this answers a longstanding question about just how abundant these stars are." Red dwarfs might have larger habitable zones friendly to ‘life as we know it’ than once thought, based, for example, on a potentially habitable "super-Earth" at least 4.5 times the mass of Earth, GJ 667Cb, was recently found orbiting the red dwarf GJ 667C researchers say. Red dwarfs are the most common stars in the Milky Way, accounting for three fourths of its stellar population. And like our Sun, red dwarfs generate energy by converting hydrogen into helium at their centers; however, the stars have less mass—between 8 and 60 percent of the solar value—so they are smaller, fainter, and cooler than the Sun. Many red dwarfs should have planets. But with red light, photosynthesis is more difficult and less effective –life there would have different conditions. However, astronomers are now able to observe nearby elliptical galaxies using powerful telescopes such as that at the Keck Observatory in Hawaii. These instruments were able to detect the faint signatures of red dwarf stars in eight massive ellipticals that lie about 50,000 and 300 million light-years away. In their observations, the scientists realized that red dwarfs were much more abundant than they had expected. The fact that red dwarfs are so common has made astrobiologists wonder if they might be the best chance for discovering planets habitable to life as we know it. More and more planets are getting discovered around red dwarfs. Joshi added that they only looked at the effects of water ice and snow, when other kinds might be important when considering how much energy a planet absorbs and reflects, such as frozen carbon dioxide, nitrous oxide and methane. Also, "we didn't look at the effects of atmospheric absorption of radiation by gases such as water vapor or carbon dioxide," he added. "That should be done in future." The results determined that there are about 20 times more red dwarfs in elliptical galaxies than there are in the Milky Way, explained Charlie Conroy of Harvard-Smithsonian Center for Astrophysics. This also means that these galaxies may contain less dark matter than was previously measured, since more space is filled with the mass of these red dwarfs. Since the number of stars is now known to be larger, the number of planets orbiting red dwarfs is also elevated. This, of course, also raises the number of possible life-harboring planets there might be, van Dokkum added. As a matter of fact, the recently discovered exoplanet, which astronomers believe is capable of sustaining life, orbits the red dwarf star named Gliese 581.Red dwarfs have been prime hunting grounds in the search for Earth's Twin. Extrasolar planets were discovered orbiting Gliese 581 in 2005, about the mass of Neptune, or sixteen Earth masses. It orbits just 6 million kilometers (0.04 AU) from its star, and is estimated to have a surface temperature of 150 °C, despite the dimness of the star. 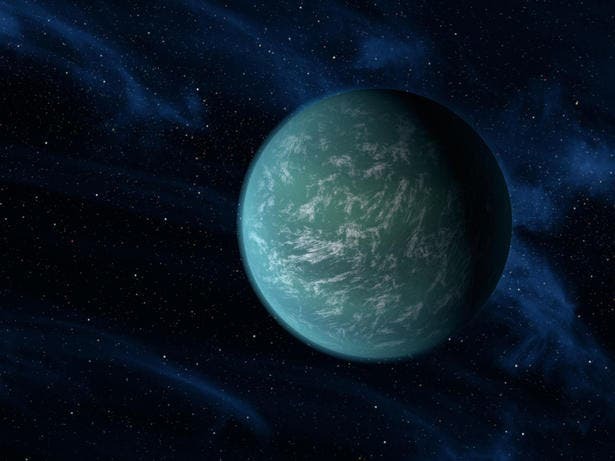 So far, among the exo-planets discovered none have shown themselves to be twin Earths. But NASA’s Kepler space telescope is providing the statistical bedrock for estimating the number of Earth clones in the galaxy. But enough exoplanet research has been done so far that a cautious prediction can be made that the odds are that the planet will orbit an M (red) dwarf star found in surveys taken within 100 light-years of Earth. Red dwarfs are much more numerous than sun-like stars, which exponentially increases the chances of being life favorable. M dwarfs make up at least 70% of the Milky Way's stars. Their masses range from roughly half to one-twentieth the mass of our sun, but what M dwarfs lack in size, they more than make up for in longevity. Astronomers estimate that these stars can burn for 40 billion to 100 billion years, giving any habitable planets plenty of time to evolve life. (The life span of our own sun, a G-class star, is about 10 billion years.) But during at least the first few billion years of their lives, M dwarfs also sport huge magnetic fields that routinely interact with their atmospheres to create coronal mass ejections—enormous outbursts of matter from the star's highly ionized corona—and proton-rich flares. The planet will be in the habitable, "goldilocks" zone around a red dwarf –– the zone where liquid water can remain stable on a planet’s surface. The zone will be closer to the cool red dwarf than the Earth's habitable zone to our Sun. The profile of a planet in the habitable zone of a red dwarf includes an orbit completed in a mere two weeks, which will provide astronomers with multiple transits to enhance odds of being observed as well as being more likely to be in an orbit aligned along our Earth-bound line of sight. Because they are much cooler than our sun, any potentially habitable planet would need to orbit them much closer than Earth does, putting it smack in the danger zone. But a new study indicates that these planets may be unexpectedly shielded from solar activity, keeping life safe. "Overall, this is excellent news for planet hunters," says Alan Boss, a planetary scientist at the Carnegie Institution for Science in Washington, D.C., who was not involved with the study and who is part of NASA's Kepler mission to search for Earth-like planets. "This further buttresses the case that the first truly habitable world we find will likely be around a nearby M dwarf." To find out if this solar nightmare would destroy any nearby habitable worlds, researchers led by astrobiologist Antigona Segura of the Universidad Nacional Autónoma de México (UNAM) in Mexico City turned to a computer model. The team simulated how a 1985 flare from AD Leonis (AD Leo), an M dwarf 16 light-years from Earth, would have affected a hypothetical Earth-like planet orbiting 0.16 astronomical units from the star. That's less than half Mercury's distance around the sun. The simulation indicated that M dwarf stars are not as dangerous as feared. "When UV radiation from the star's upper atmosphere encountered the Earth-like atmosphere of our model planet, the energy resulted in a thicker ozone layer in the planetary atmosphere, providing a natural shield for the planetary surface," says astronomer Lucianne Walkowicz, a Kepler postdoctoral fellow at the University of California, Berkeley. That's because the UV radiation actually split molecules of oxygen to create more ozone than it destroyed. "Throughout most of the flare, the surface of our model Earth-like planet experienced no more radiation than is typical on a sunny day here on Earth," Walkowicz says. The findings are especially good news, says Segura, because AD Leo is a young star—less than 300 million years old—and as a result is one of the most active M dwarfs known. The star's 1985 flare was 1000 times as energetic as a similar flare on our own sun. So the fact that the model planet's atmosphere survived such a violent event may bode well for planets around similar young M dwarfs, she says. Young red dwarfs have awesome stellar flares that can erupt without warning and blast out lethal doses of ultraviolet radiation destroying surface life. Ocean life, however, may be safe from the UV just a few feet underwater and still extract enough light for photosynthesis. In summary, he found that UV radiation actually split molecules of oxygen to create more ozone than it destroyed. The simulation made a thicker ozone layer in the planetary atmosphere such that the surface experienced no more radiation than is typical on a sunny day on Earth. What’s more, as the dwarf settles down to a quiescent existence, there would be very little ultraviolet light and an UV filtering ozone layer would not even be needed. However, potentially habitable red dwarf planets may keep one hemisphere locked onto their star due to gravitational tidal forces. The resulting slow rotation may give them anaemic magnetic fields that do not block cosmic rays effectively. The answers may be coming soon via the James Webb Space Telescope, which has been re-scheduled for launch in 2018, would be used to spectroscopically 'sniff' out the exoplanet's atmosphere for chemistry that might be a by-product of organisms on the surface. If these planets develop a natural UV shield, then the discovery of an inhabited world may be no more than a decade away.